Which Treatments Can Be Used For A Face Makeover? This patient appeared to look very tired and worn out. Her upper eyelid has excess skin and fat which is causing it to close over her eyes. 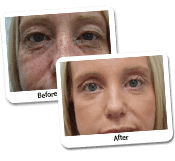 She has fine lines and wrinkles, particularly in her frown area, lower eyelids and around her mouth. She has some volume loss in her cheeks which is causing her lower face to appear heavy. This is the patient post Erbium resurfacing of the full face, a Suture Lift, Upper and Lower Blepharoplasty, Neck Liposuction, muscle relaxants and fillers. Notice how much this procedure has opened up her eyes. She now appears refreshed and her skin looks smooth and hydrated. Patients often consult with Dr Lanzer about what cosmetic procedures would benefit them most. Below, you can find out more information about one of our case studies where a complete makeover was performed including Face Makeover Before & After Photos (5) above. 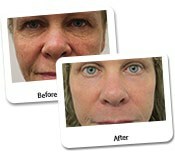 Why Did This Patient Choose a Face Makeover Before & After Photos (5)? This patient was struggling with an overall tired and worn-out appearance. She had excess skin and fat on the upper eyelid, making her eyes appear smaller than they actually were. The patient also had fine lines and wrinkles around the frown area, lower eyelids and mouth, contributing to a tired appearance. She was also experiencing volume loss in the cheeks, making her face appear saggier. 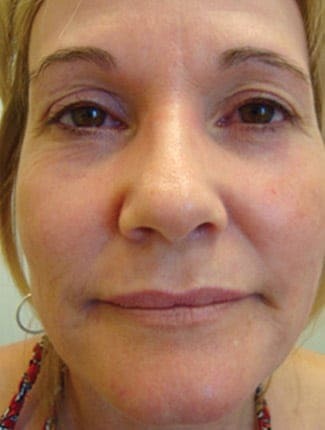 Given the fact that the patient wanted to correct numerous problems, she chose a complete makeover including procedures such as Erbium resurfacing, suture lift, blepharoplasty, neck liposuction, muscle relaxants and fillers. The result of these procedures was remarkable, considering how much younger the patient in question looked after treatment. Erbium resurfacing is a special procedure that focuses on the removal or reduction of deep lines and wrinkles in the face, hands or chest. Contrary to treatment with a carbon dioxide laser, Erbium lasers have fewer side effects; resulting in a faster recovery from a skin resurfacing treatment. What Is a Suture Lift? Over the course of time, and due to environmental factors which include smoking and sun exposure, the skin will start to sag and become less elastic. For these types of problems, the suture lift or thread lift is the recommended procedure. Contrary to most face lift procedures, the suture lift is a less invasive and expensive procedure and patients can expect a quick recovery process. 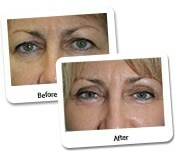 The thread lift is designed to rejuvenate the face, more specifically around the area of the brows, cheeks and jowls. Depending on the problems you are facing, the surgeon may choose to incorporate a suture lift procedure in your makeover plan. 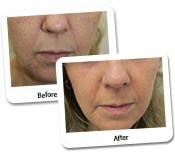 Dr Lanzer also offers a face lift with dissolvable threads called the V lift. These last about 12 months. 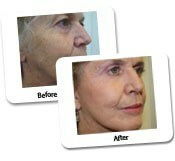 The most effective face lift for Dr Lanzer remains the mini face and neck lift. Blepharoplasty is the surgical repair or reconstruction of the eyelids and is used for the correction of defects, deformities and disfigurations. A blepharoplasty is performed by making an incision in the natural crease of the upper and/or lower eyelid. By making the incision on that natural crease, the surgical scar will not be visible once the procedure has been completed. Once the incision has been made, the surgeon is able to remove excess adipose tissue. The average blepharoplasty procedure takes approximately 1 to 2 hours to complete, depending on the area that needs to be treated. Neck liposuction is implemented when the patient is struggling with an excessive full or double chin, even though the patient is not over weight. During a neck liposuction procedure, the surgeon will remove any excessive fat from the area by making 1 to 2 small incisions beneath the chin or behind the ears. By inserting a small cannula through the incision, the surgeon will be able to remove the fat and sculpt the neck area to obtain the desired form. When Are Muscle Relaxants Used? Muscle relaxants have been used in the world of cosmetic surgery for more than twenty years. Muscle relaxants are a safe way to reduce frown lines, forehead creases and crow’s feet, eliminating the need to choose a more invasive treatment. A muscle relaxant will be injected with a very fine needle. Once injected, the substance will soften the hyperactive facial muscles, more specifically by blocking the impulses between nerves and muscle. 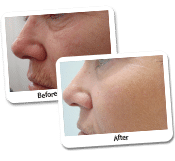 Fillers are also popular amongst the range of anti-ageing treatments. Just like muscle relaxants, fillers fall under the category of non-surgical cosmetic procedures. 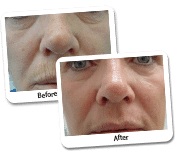 There are various different types of fillers and each has its own set of benefits. The most common type of filler is the dermal filler which helps to reduce deep lines and wrinkles, and also have the ability to smooth the contours of your face as well as enhance sunken cheeks. 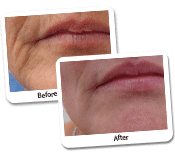 Ageing skin tends to lose collagen, which is the substance used to shape and support the skin. Collagen disappears for a variety of reasons, including sun exposure, smoking, air pollution and even stress. 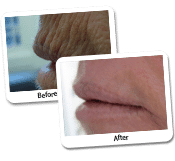 If you have lost a considerable amount of collagen, treatment with a suitable filler could provide you with a solution. Am I Eligible for a Full Makeover? Makeover will help skin texture- laser resurfacing or fractionated therapy, drooping of the face with mini face lift, eye lid rejuvenation and neck line shaping. To determine which procedures would be best for you, please book an appointment at the Dr Lanzer clinic and they will be able to point you in the right direction and help you achieve the results you want.